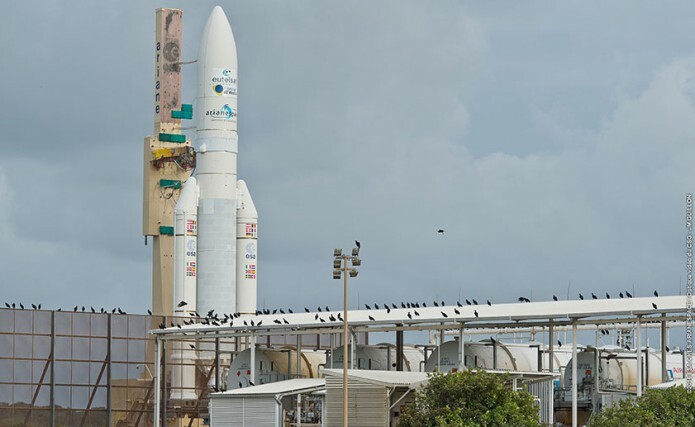 An Ariane 5 rocket topped by a heavyweight communications satellite for Eutelsat emerged from its hangar in French Guiana on Monday for a railroad ride to a nearby launch pad for final flight preps. 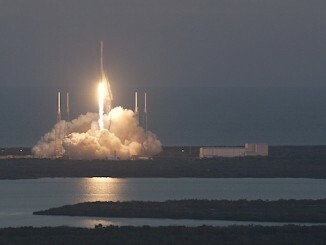 The 180-foot-tall (55-meter) launcher is set for liftoff at 12:20 a.m. EST (0520 GMT) Wednesday, or 2:20 a.m. local time at the Guiana Space Center, a European-run spaceport carved from the jungle on the northern shore of South America. 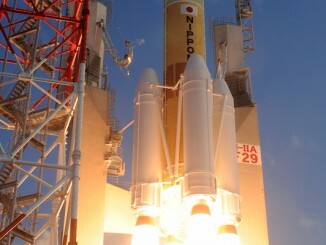 The launch window extends for three hours. 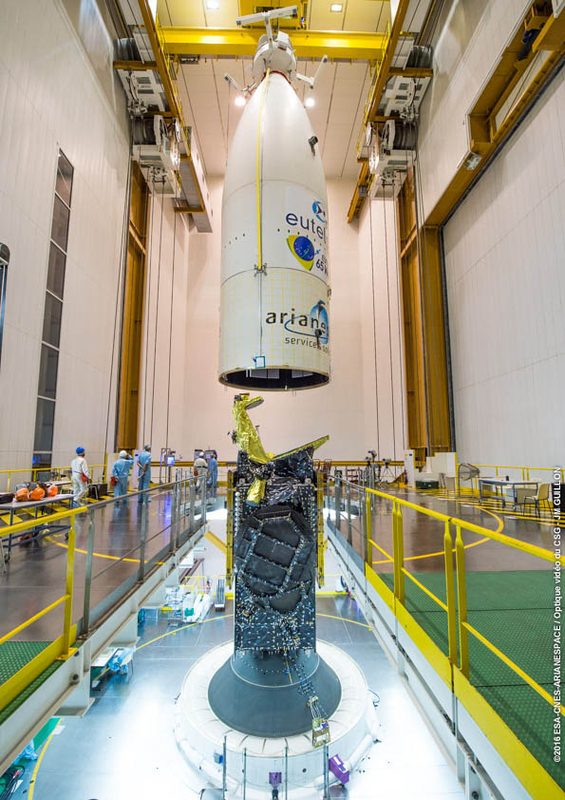 The Eutelsat 65 West A satellite attached to the top of the Ariane 5 rocket weighs more than 6.5 metric tons — 14,471 pounds — and will be the sole payload aboard Wednesday’s early morning mission. Manufactured by Space Systems/Loral in Palo Alto, California, the powerhouse satellite will broadcast in three bands — C-band, Ku-band and Ka-band — to link video distributors in Europe and Americas, beam direct-to-home television programming across Latin America, and provide broadband connectivity to Brazil. Eutelsat aims to have the satellite in service before the opening of the Rio Olympics in August. The satellite’s launch was moved up to ensure it could relay television signals for the 2016 Summer Games, and Eutelsat paid extra for a dedicated Ariane 5 flight earlier in the year. The Ariane 5 typically hauls up two large communications satellites per mission, but a properly sized co-passenger was unavailable for a launch in the timeframe desired by Eutelsat. Wednesday’s launch is the second Ariane 5 flight of the year, and the 85th Ariane 5 mission overall. The countdown will begin Tuesday at 1750 GMT (12:50 p.m. EST), followed by a check of the rocket’s electrical systems around 2150 GMT (4:50 p.m. EST). Ground crews at the ELA-3 launch pad will configure the facility for liftoff by closing blast-proof doors, removing safety barriers and configuring fluid lines for fueling. The flight program will also be loaded into the Ariane 5’s computer. Cryogenic liquid hydrogen and liquid oxygen propellants will begin flowing into the Ariane 5’s first stage around 0020 GMT (7:20 p.m. EST). The process begins with the pressurization of ground storage vessels, then the fuel lines will be chilled down to condition the plumbing for the flow of super-cold liquid hydrogen and liquid oxygen. A similar procedure for the Ariane 5’s cryogenic upper stage will commence at 0120 GMT (8:20 p.m. EST). Chilldown conditioning of the Vulcain 2 first stage engine will occur at 0220 GMT (9:20 p.m. EST), and a communications check between the rocket and ground telemetry, tracking and command systems is scheduled for 0410 GMT (11:10 p.m. EST). 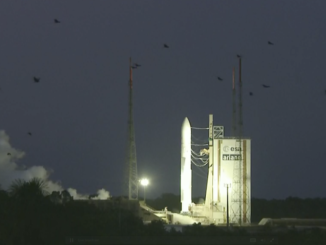 Seven minutes prior to liftoff, control of the countdown will switch to an automatic sequencer to oversee final pressurization of the Ariane 5’s propellant tanks and arming of the rocket for flight. The Ariane 5’s hydrogen-burning Vulcain 2 main engine will fire up as the countdown clock reaches zero. Seven seconds later, after the Vulcain 2 clears an automated health check, the Ariane 5’s two large solid rocket boosters will ignite to propel the launcher skyward. The main engine and solid rocket boosters will generate 2.9 million pounds of thrust at liftoff and accelerate the Ariane 5 past the speed of sound in less than 50 seconds. At T+plus 2 minutes, 32 seconds, the twin boosters will peel away and fall into the Atlantic Ocean. The Ariane 5’s nose cone, made by Ruag Space in Switzerland, will jettison at T+plus 3 minutes, 39 seconds. By the T+plus 8-minute, 49-second point in the flight, the Ariane 5 rocket’s core stage will have consumed its 385,000-pound (175-metric ton) load of cryogenic propellants, and the Vulcain 2 engine will shut down. Moments later, the first stage will separate to re-enter Earth’s atmosphere just west of Africa, as the second stage’s HM7B powerplant takes over the mission. The nearly 16-minute firing of the HM7B engine will inject Eutelsat 65 West A into an egg-shaped geostationary transfer orbit with a high point 22,211 miles (35,746 kilometers), a low point of 150 miles (255 kilometers), and an inclination of 0.5 degrees to the equator. Cutoff of the liquid-fueled HM7B engine is timed for T+plus 24 minutes, 41 seconds, followed by deployment of Eutelsat 65 West A at T+plus 27 minutes, 23 seconds. The satellite will use its on-board propulsion system to circularize its orbit, heading for geostationary altitude almost 22,300 miles (nearly 36,000 kilometers) above Earth, where its velocity will match the rate of Earth’s rotation. 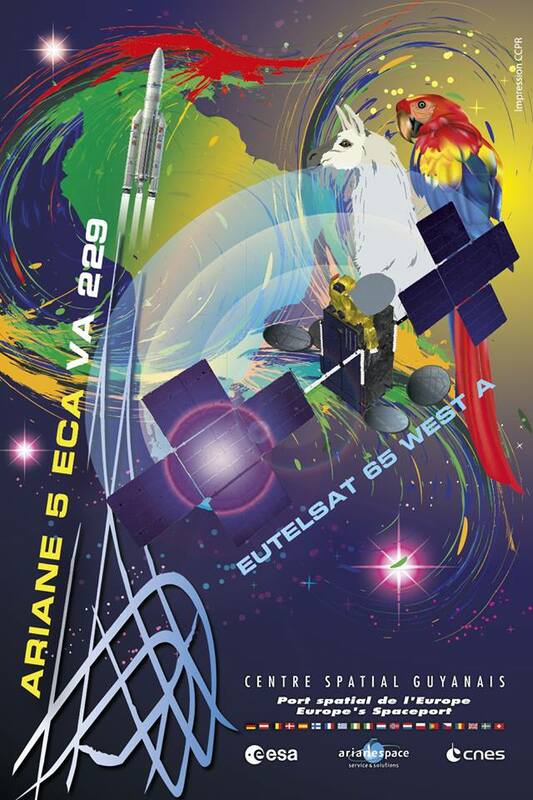 Eutelsat 65 West A will eventually settle into an operating post at 65 degrees west longitude along the equator.